As we ring in the new year, Chinese New Year to be specific, we see many beauty brands mushrooming the market with cny deals and promotions, of which I am thrilled about. But the ones that stood out for me were from Estee Lauder. Especially that now Valentine's are pretty much in between the celebration, the competition is real! This season, Estee is sharing with us a limited edition Advanced Night Repair in a beautiful GOLD bottle - (oh and it comes with a monkey charm to celebrate the year of the monkey) together with the Advanced Night Repair Powerfoil Mask. The groundbreaking combination offers amazing penetration for immediate health and glow to the skin. 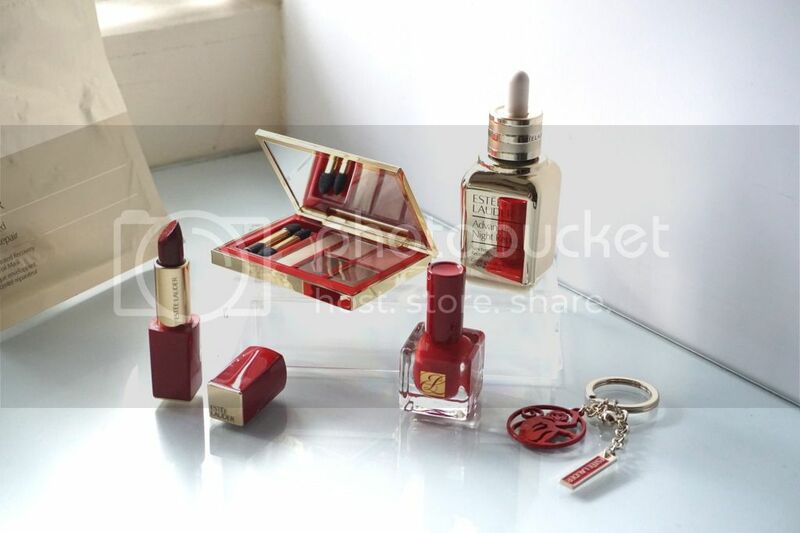 Adding onto the golden list of pretty things, the brand introduced the limited edition Modern Muse Le Rouge Make Up Collection - which consists of a Pure Color Nail Lacquer in N3 Envious, Pure Color Envy Lipstick in Red Ego and a Pure Color Envy Sculpting Eyeshadow in 12 Pink Mink - all in full-red packaging, perfect for both CNY and Valentines Day. Talk about killing two birds with one stone. The collection is now available at your nearest Estee counter or you can order them online here.